It was 2 days before Christmas and Trevyn was excitedly preparing her final details and plans for the festive celebrations. Her boyfriend, Harry gleefully explained that he had a special plan for the couple in the morning named 'Project Elf' which, to Trevyn's disappointment who is a less of an 'early bird', included an early start. When the time arrived, Harry whisked away his beautiful, but rather sleepy and a little bit grumpy, girlfriend off to Haytor Rocks, Dartmoor. After a trek up the rocks, the happy couple watched the sunrise and snapped some stunning photos, when Trevyn thought they were about to leave. However, much to her surprise Harry knelt down on one knee and asked for Trevyn's hand in marriage. The wedding was a huge success with an intimate ceremony on the first day and grand, fun filled party on the second. Set in the stunning Great Barn in Devon, the venue was picturesque and dressed in white and cream flowers. Trevyn stole the show and took her grooms breath away when she walked down the aisle. Dressed in a beautiful, embellished Eliza Jane Howell wedding gown, Trevyn looked flawless in this cap sleeve, v neck, vintage style gown. Her hair was curled with a 1920's vintage head piece that finished off a fairytale look. 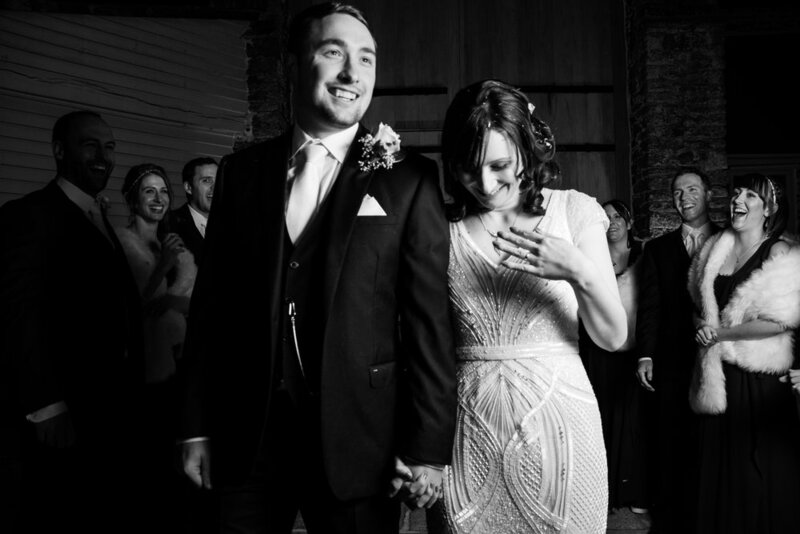 As she walked towards the man of her dreams, any nerves and ants were relieved and Trevyn couldn't wait to say yes to spending the rest of her life with the man of her dreams. I was a little nervous. My go to for nerves is sugary tea and time with my mum. Meet with them beforehand, make sure it's clear what your vision is for your photographs and the locations you would like to have photos taken. I would have a photographer who was with us both days for the whole time. Unlimited natural photos. I got caught up in needing to provide formal photos for friends and family and lost out a little on the more natural fun photos. I was terrified in the planning stages, I don't like being center of attention and the whole thing just seemed so overwhelming. On the day, none of that matters, those feelings slip away as soon as you see your groom and then the rest of the day feels like you're swept up in a fairytale. So my advice is try not to worry. Mostly on recommendations from other brides. Going on adventures as husband and wife. Published on July 27, 2018 by Mary Jeremiah. Don’t let your hair be a nightmare! Happy Hair Day! 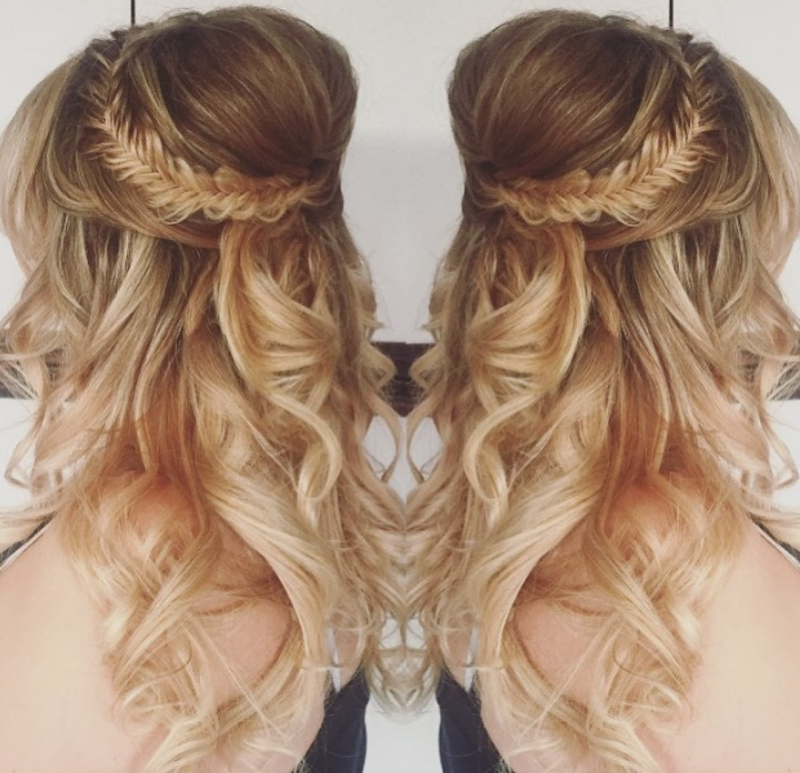 We are in full swing of our Bridal Hair Month and we are LOVING these posts. P-Lease tell me you read all about L.H. Professional last week?!? The advice Laura gave us has become our hair bible! So drumroll please as we welcome week number 4 hair guru.. Vicki from VM Hairdressing!! This immensely talented hair stylist runs her mobile, freelance hairdressing salon covering Nottingham and Derby. 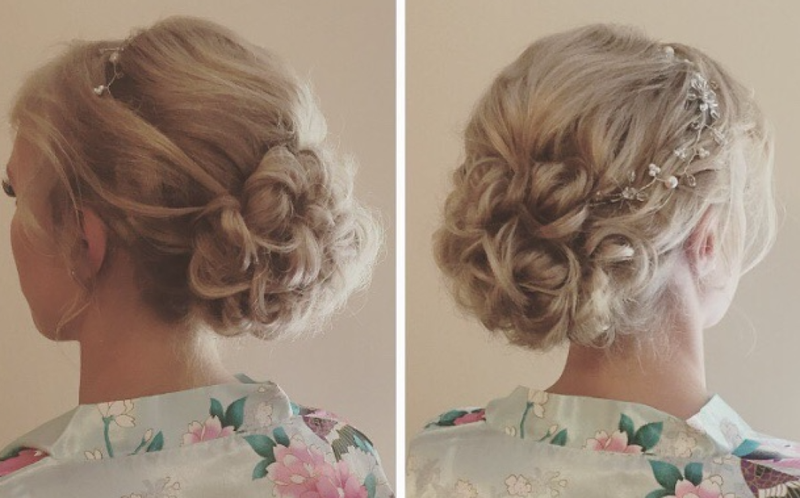 We spoke to Vicki about all her top tips, advice and ideas for the perfect bridal hair. Boy. She knows her hair. Follow Vicki’s recipe for the perfect do and let us know what worked for you! When a bride wants to achieve that shimmer and shine… What's your go too hair product for long lasting shine? Lee Stafford shine spray or Toni and Guy products are both good for shine. Even though a bride’s wedding day will simply fly bye.. her hair better not fly out of position.. What hair spray or hold would you recommend for a bride to keep her do in all day? Matrix hair spray is great also the milkshake spray. 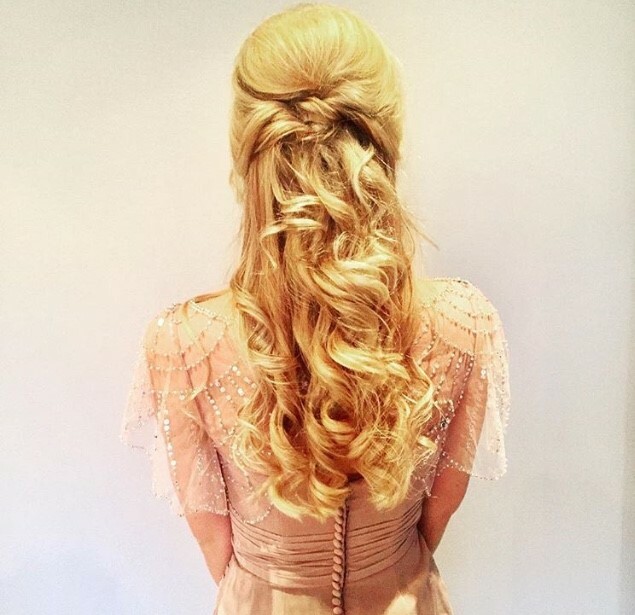 For ladies with long, thick hair how would you suggest styling it on their wedding day? I always love an updo for a wedding personally however, it depends how thick it is. The mermaid type plaits look amazing with thick hair. For Ladies with thin, shoulder length hair, how would you suggest styling it? I would suggest something where we could either add hair pieces in or get the hair up possibly with a pad. If the hair is down it could possibly go Kano throughput the day. A bride has to have some secrets I'm sure extra hair or a pad would give this bride more confidence. I always say wand is for a wedding and straighteners are for a night out! Curling with a wand tends to last much longer. I always have straighteners in my kit alongside heated rollers, hair pads, grips, bands, section clips and tons of styling products!! What are your favourite hair accessories for bride for her wedding day? I love the hair vines and they look incredible in a mermaid style plait. Please state your business name and a bit about what you do! 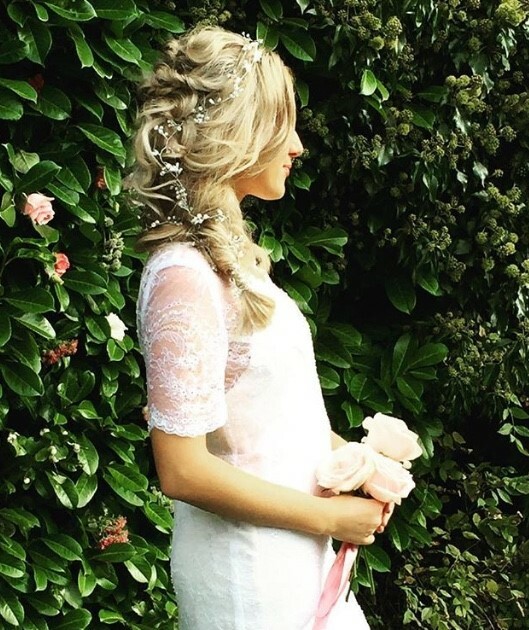 VM Hairdressing - I provide a bespoke service where I work with the Bride to design the best look for her wedding. I travel to the venue and organise timing plans to ensure she is ready on time. I just love being part of a Brides special day! What is this season’s most popular bridal hair colour? I always think natural colours photograph much better. We have seen a lot of bayalage last year and this trend seems set to continue. In my view, a few highlights often lift the entire look and stop darker colours looking too blocky. It also catches the sunlight and makes your hair sparkle! Providing they are very fine and suited to your base colour e.g. Caramel tones work beautifully with a brunette base. Would you recommend a bride to dye her hair before her wedding day? No, stick to your current colour, no risks!! If a bridesmaid has a shade of hair colour that the bride isn't so keen on, what advice would you give for the bride to approach this situation? I think everyone should be an individual and it can often work in the brides favour if all of her bridesmaids have a different look. It could always be broken up with the use of fresh flowers to help tie the look together. I'm not sure bridesmaid duties extend to changing their hair colour. What seasonal hair colours work best? Darker or lighter in winter? Highlights or lowlights in summer? It's a personal choice and depends on the client’s skin tone, colour of the dress etc. Personally, a more natural look will always flatter, don't be a slave to the trends. Work with your colourist to achieve the most flattering look for you. Pre-Wedding date, what hair care routine would you recommend leading up to the bride’s big day? Regular treatments (olaplex is my favourite) will always improve the condition of the hair, plus keeping it trimmed every 6-8 weeks. An everyday treatment that is AMAZING is Uniq one spray (I call it magic spray). This should be sprayed on wet hair, it's so fantastic and does 10 jobs including protecting her from UV rays and detangling. Making it the perfect honeymoon product. I stock this product for £13. The night before her wedding day, what hair care routine would you recommend for our brides? Most brides prefer to wash their hair on the wedding day. However, it is preferable for your stylist if you wash your hair the night before. Wash it with volume shampoo and conditioner followed by magic spray. Once hair is damp then apply a root product such as root boost then continue to dry. If you are wearing it in a specific parting the next day make sure you put that in. Then get a good night’s rest! Well, another day, another dress, another dazzling hair do. We can’t get enough of these hairdressing professionals with their never-ending supply of hair advice and knowledge. Our last post was based on the interview we conducted with L.H. Professional Hair. It was a total hit. The comments and love we received were so amazing that we thought we better give you some more top tips from the Queen of hairstyles, Laura, from L.H. Professional Hair. This week we pestered lovely Laura, all about the best hair products and equipment she uses to create a professional look. We spoke to her about the ideal bridal hair style depending on the form and design of the wedding dress and Laura gave us a really detailed account of her valuable opinion. What's your go to hair product for long lasting shine? For finer hair, I adore Wella EIMI shimmer delight spray. It adds a beautiful shine to hair and the light mist will not weigh down your style. As a good all round product I would use Wella reflections oil or L’oréal Mythic oil, both smell incredible and add mirror like shine to your hair, they are easy to style with and don’t leave your style feeling or looking oily. What hair spray or hold would you recommend for a bride to keep her do in all day? My go to hair spray is Dynamic fix by Wella for an up do. It has a really strong flexible hold and allows you to style the hair while setting. It has a nice smell, doesn’t give off strong fumes and leaves no residue. For looser hair down styles I like L’oréal Infinium soft, it gives a gentle hold and helps protect against the effects of humidity. For each style of wedding dress what hair style would you recommend? For this style I like hair all down or partially down, centre partings and loose Hollywood waves work well, drawing attention to the face and down the neck line. It must be hair up. You don’t want to hide all that gorgeous detail. Vintage inspired styles work well but keep your hair soft and natural with an off-centre parting and few tendrils to ensure the look doesn’t become too stiff or structured. I like to go classic with this shape. A softly structured chignon or bun worn high or low is the perfect princess look and creates beautiful lines and elegant length by showing off your neck and shoulders. Spaghetti straps say comfort and simplicity to me. Up or down works well, Loose bo ho braids and undone up dos, a big chunky fishtail plait over the shoulder or beach waves for mid length hair. Long thick hair can be a dream to work with as there are so many options, up or down works well but that’s ate pros and cons. Down looks stunning and shows off that gorgeous length but styles such as curls, often don’t last as the weight of your hair can pull the style out, and for a summer wedding it can get very hot under there. You would need to make sure you set your hair and use a good spray to ensure a better hold and to protect against humidity. For these reasons, maybe an up do would be better, the only issue here could be the weight of your hair and making sure it’s properly secured without being uncomfortable. Be sure to tell your stylist if your hair feels too tight or heavy as you will be wearing it like that all day. Depending on your chosen style, if your hair is extremely thick it may be worth considering having it thinned out a little by a professional a few weeks before the big day. Any way you like. finer hair works well being blow dried we to add volume and soft waves or curls add texture and the illusion of thickness, but now extensions are fantastic for allowing finer and shorter hair brides have exactly what they want. I prefer Clip in extensions as they are less damaging and i recommend only using small amounts of added hair so your style still looks natural and as if it’s your own. If a bride struggles with having sparse or low density hair near the roots, this can be a problem as the scalp can often show through and name hair appear even finer, a good hack for this is to buy some coloured dry shampoo to match your shade. Once applied at the root area it can cover these patches and give the illusion of more hair. What are your favourite hair accessories for a bride on her wedding day? Choose an accessory that works well with your style. I am a big fan of bespoke accessories and actually create my own for brides, including hair vines, combs and pins made from flexible silver or gold wire. I think having flexibility in an accessory is so important as a lot of shop bought pieces don’t fit the head properly, they can look as if they stick out from a style rather than being a part of it. My absolute favourites thing to work with is fresh flowers. They smell amazing and look amazing. They are so easy to work with and you can be subtle or bold with the look and match them in with your colour scheme. So when it comes to booking your hairdresser for the big day, contact Laura from L.H.Professional for amazing designs and styles from a friendly and trustworthy hairdresser. Published on July 20, 2018 by Mary Jeremiah.